William Martin were appointed by the London Borough of Southwark to design a new covered Multi Use Games Area at the Charter School, complete with floodlighting and a new all weather play surface. The new MUGA was constructed on the base on an original sports hall, which needed to be demolished as it was not economical to maintain. 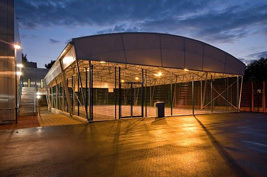 The school had a limited budget for the scheme which was insufficient to build a new sports hall and therefore William Martin suggested adopting a lightweight fabric framed system, which could be built within the budget available. The system was procured from a specialist company allowing for quick assembly and the school is very pleased with the final result, which has proved very popular with the children.